This component of the workshops seeks conceptual design ideas for and along the River’s Edge. All sorts of ideas are encouraged, from repurposing of the river and/or the pedestrian promenades and green belts. The idea is to revolutionize the concept that the river could become the ‘living room’ to the City dweller and not an obstacle. The Task: The goal of this workshop is to come up with a daring and provocative idea for a Green Island on the Vistula River. The realization of this concept is hinged on a historic precedent during the period 1891 to 1938 when Vistula’s shoreline was primarily perceived as a fortified edge, and there once existed a naturally vegetated island with a Villa. This island once had very strong and important linkages to the nearby neighbourhoods where the Wawel Castle and other historical monuments today still exist. The Green Island should be fashioned as a public multifunctional venue which would regenerate that historic visual link and allow the celebration of both Cracow’s history and its past. The Task: Participants should provide ideas for the erection of temporary + multifunctional pavilions/objects that have a specific design and programme for the Vistula boulevards along the south-side of the River. The participants should take into account its locality (i.e. in front of historical monuments), landscaping, pedestrians, cyclists, in order to provide all-season venues for the local residents to use. The role of these new temporary pavilions/objects is to animate the riverside throughout the year. The Task: The goal is to develop a concept for a temporal marketplace, which would primarily operate during the day. It should be Flexible, Modular and Mobile. The ideas should accommodate the element of ‘transformation’ and ‘adaptability’, between work and play. The concepts must challenge notions of duality and compatibility towards trading spaces and recreational spaces. Residents must be able to reactivate the marketplace to a more vibrant and interactive environment after hours. 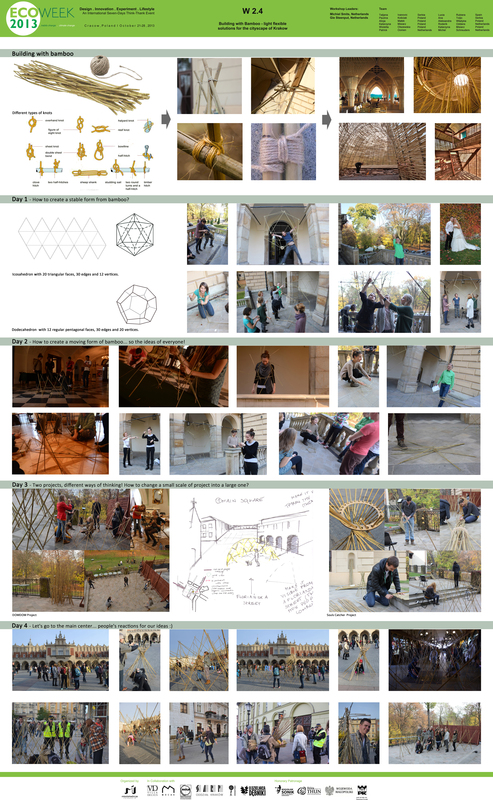 The Task: Participants will learn basic geometric designs and constructions with bamboo sticks on the first day. Here they will learn and investigate the possibilities of different geometric shapes and binding techniques that will form the basis of their skills for the rest of the workshop. In the afternoon, based on the experience of the city tour, the participants will investigate various locations in the city (in two groups). Documenting the different locations and brainstorming possibilities will form the main results of the first day. On the second day participants will prepare a short presentation of the different locations by means of hand drawings and explain their ideas/strategies and possible designs. From here comments and notes will be used to alter strategy and design. During the rest of the day participants will experiment with their ideas on 1/50 scale models and by the end of the day present the results. On the third day participants will practice the construction of their design on full scale on the workshop location. Here problems, errors and others will be tested and altered in the final design. In the evening of the third or the morning of the forth the various designs will be constructed on the target locations. Here the participants will document their result by pictures, movies, drawings and whatever is needed to evaluate their design. In the afternoon and evening students and tutors will work together to document everything per team in presentations. Every team will design their own poster (which will be developed throughout the days) and a final presentation will form the final product of this workshop. The different presentations will be given on the last day. The results: Please look at the movie!